feminism in tech remains the champion topic for my block list. my finger is getting tired. Executive suites are full of smug assholes. If Dickinson worked on Wall Street, the episode might have started with a Dealbreaker headline and ended with a slap on the wrist (save for concerns about a discrimination or harassment suit). Maybe Snapchat would have been his salvation. He’s even managed to semi-successfully rebrand his hate speech as performance art. Dickinson’s noxious tweets, however, surfaced in the middle of a heated debate about the lack of women and people of color in tech, and the degree to which the tech sector is responsible for increasing inequality in the midst of an ever-widening income gap. In less than 24 hours, he was out of a job. Shaming a misogynist and bigot into unemployment is not the goal. And it's not enough. Nobody believes the myth that Silicon Valley is a meritocracy, except maybe its gatekeepers. It’s like some relic from A Time Before Brogrammers that they keep trying to retrofit onto today’s rockstar entrepreneurs—even as “party rounds” and pools of dumb money prop up products that often just serve themselves. There are persistent and undeniable race and gender gaps in funding and hiring in the tech sector. But the priesthood has until very recently insisted their boy’s club was open to any innovative hustler. The same blinders were applied to race. 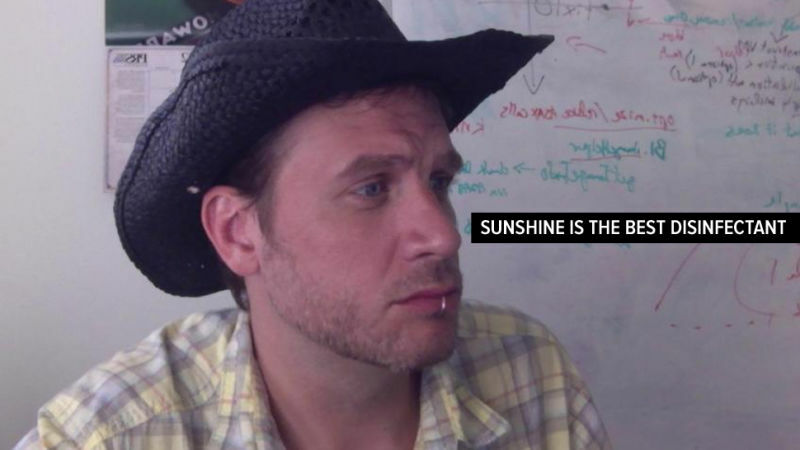 “I’ve certainly heard my share of sexist and racist jokes in Silicon Valley, but hardly enough to believe that people like Michael Arrington or Paul Graham are lying when they say that they are colorblind,” author Eric Ries, the man credited with the “lean startup” method, wrote on TechCrunch. In the past month, we’ve seen more clearly than ever what that see-no-evil attitude has wrought: a culture that laughs at sexist “jokes” and turns a blind eye to misogyny and racism, even when it’s been tweeting at you for years. Removing Dickinson from his position doesn’t “disinfect” Business Insider, or the tech industry at large. Light needs to be shone on the systems and structures into which Dickinson fits—like the institutional permissiveness of a company that purports to “value diversity.” Blodget interacted with Dickinson on Twitter, so presumably he saw his executive’s digital bile, which openly flouted the social media policy Blodget himself outlined. One editor opted to block Dickinson entirely: See no evil, hear no evil, RT no evil. Business Insider Wonders: Are Women Too Lazy to Succeed at Goldman Sachs? "misogyny" is "hatred of women". It is not misogyny to tell a sexist joke, or to fail to take a woman seriously, or to enjoy boobies. That's the status update that finally got Dickinson the attention he craved. It’s a reaction to TechCrunch’s apology for showcasing a “joke” app called “Titstare” at its biannual conference. The onstage demo was exactly as gross as it sounds. At both Latino2 and the Platform Summit, someone proudly described Y Combinator and Kleiner Perkins [a venture capital firm] as “colorblind”, “gender blind” and/or “agnostic on race and gender.” In each instance, one of us took on the speaker, pointing out that aspiration and actuality are different. To ignore biases, however subtle or unintentional, is to allow them to flourish. Institutional biases are often unconscious. And the dissonance between aspiration and execution in the tech sector is glaring. Well. I never called Graham a xenophobe. But I do think Graham’s altruistic intentions have blinded him to his own bias—and the material effect it has on his industry. He claims he has “empirical evidence”—as always, the last refuge of people struggling to justify their prejudice—that the inability to understand CEOs with strong foreign accents will tank their business, but he won’t say how many of Y Combinator’s 564 startups had foreign-born CEOs. The data itself is self-selective: Y Combinator would already have to have let the company into the gate. Parroting such claims, especially when startups have bigger problems, encourages more bias. When you tell the tech world that your organization looks for college dropouts who look like Mark Zuckerberg, that makes it easier for Pax Dickinson to tweet with impunity about "blocking" women. And this attitude is important beyond the tech world, partly because there is no “beyond the tech world” anymore. People like Graham and Blodget and investors like Andreessen Horowitz and Highland Capital Partners help decide which apps or services get attention and funding. They will play a role in what technology you use and by extension how culture is shaped. They are building their values into the infrastructure of your life. Imagine if the culture of the technology industry was different, and that instead of firing Dickinson, Business Insider had, at some point over years of his vile tweets, made it clear that the company values diversity and checked to see whether that was reflected in his role as a manager and executive with hiring power. Instead, we have another aggrieved tech bro dismissing all the haters, confusing freedom of speech with freedom from consequences as a top executive of a major brand. Shed no tears for Dickinson, though. 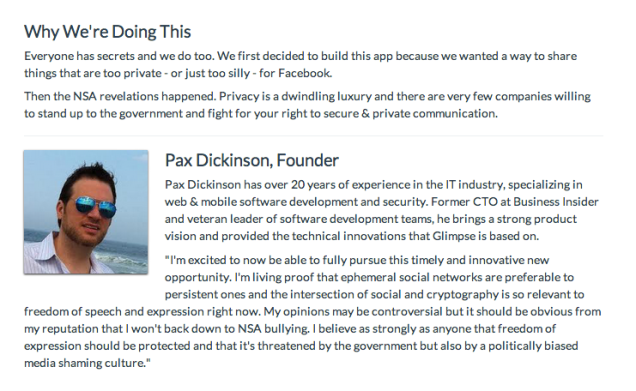 He’s already found a way to cash in on his bad brogrammer rep with a new ephemeral messaging startup, in the works before he got canned, called Glimpse that protects images users send from screenshots. “Of course, we take Bitcoin,” the site advertises. 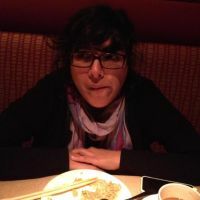 His cofounder, whose name is now removed from the site, is Elissa Shevinsky. 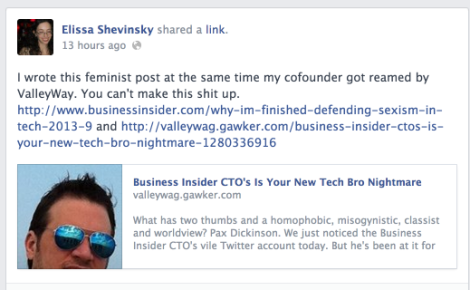 After the Titstare controversy, Shevinsky wrote an article, which was reposted on Business Insider, about why she stopped “defending sexism” in tech. Let's be clear—sexism isn't owned by startup bros from frats out of MIT. I've been hit on by VCs (one messaged me on Gchat to ask if my OKCupid profile was for research) and another introduced himself at the TC August Capital party by stating that he'd like to make out with me. (To be fair, my badge read "CEO of MakeOut Labs," but that introduction was brazen). I've been sympathetic to these bad actors. With so few women around, it's almost reasonable that they can't get past seeing me as one of their only romantic prospects. And yet, we find ourselves wondering why more women don't choose to be part of this world. Earlier today in a since deleted tweet, his cofounder Elissa Shevinsky offered TechCrunch a post about Glimpse, but I guess the formal announcement has found a port in the storm in Medium instead.